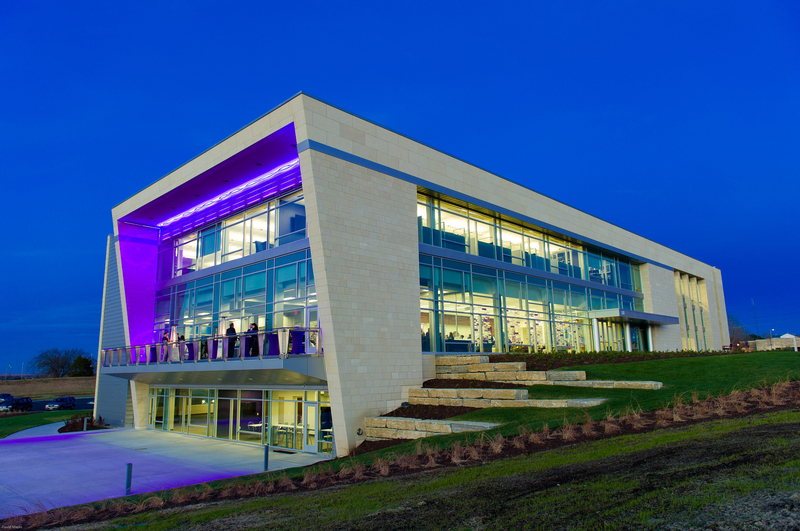 The Kansas State University Foundation and Kansas State University celebrated the opening of the K-State Office Park on Friday, Dec. 4, with a ribbon-cutting ceremony and open house. The new building is the first in a multiphase project that will fuel collaboration, philanthropic support and economic development in the North Campus Corridor. On the corner of Kimball and Denison avenues, the first 60,000-square-foot building in th e K-State Office Park offers a new home for the KSU Foundation and office space for corporations and industry. Equally important, the K-State Office Park will add space for corporate and industry partners. Among the first partners to be located in the office park are Garmin, U.S. Engineering, G.E. Johnson Construction, the Veterinary and Biomedical Research Center, and the Center of Excellence for Emerging and Zoonotic Animal Diseases. 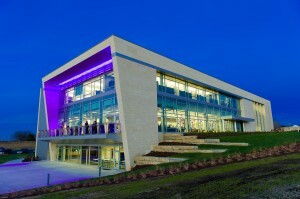 The K-State Office Park’s first building is on the site of an office building that was originally started by the KSU Foundation in 2007 and discontinued in 2008 due to the onset of the Great Recession. The $11.5 million cost of the new building, financed through a commercial loan, was helped by using previously purchased building materials and the same footprint as planned in 2007. Pre-leasing has begun for the second 60,000-square-foot-building, expected to break ground in 2016. The KSU Foundation was established in 1944 as the official fundraising arm of Kansas State University. It is a separate, independent entity chartered by the state of Kansas as a 501(c)(3) nonprofit education corporation. For information about leasing opportunities, contact Kate Ryan at kater@found.ksu.edu or 785-532-7559 or visit www.k-siteonline.com.